What is your favorite MSX cartridge that you wanted to see revived? In your opinion, what killer app that would deserve the right to be revived for use on the 1ChipMSX? What would be a fabulous title to be bundle with the package !? What are your personal favorite cartridges ? Is there cartridge version of those games ? In the old magazines there was a lot of mentions about tapes. Another game that is very nice is Stone of Wisdom. ANY Level 9 adventure ; Auf Wiedersehen,Monty ; Vampire - Never existed on cartridge as far as I know. Another game that I wanted was the arcade port of Xevious. one of the questions was;"What would be a fabulous title to be bundle with the package !?" Huh? The MSX2 version of Xevious is not really a 1:1 port of the arcade version. It was a version with extra features (1 extra game mode), developed by Compile. I know ... The best part is that the Xevious game is entirely in plain English Language. The 2012 South America part is very nice ... Indeed! Thinking about it ... It is weird that a game sold in Japan was developed to be played into English language. This is somehow unusual. Although I dream a 1chipMSX version of Xevious 3DG or a "Return of the Vampire Killer", I think the best killer application would be an original-concept game, maybe using some custom VHDL extensions to MSX architecture, making it available only to real 1chipMSX users. 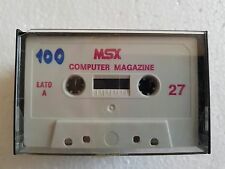 is to use it on a REAL MSX!